Todays blog photo is of a Green Woodpecker sunbathing on a standing stone. 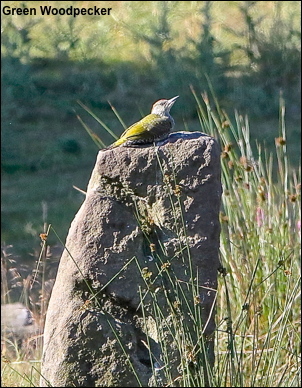 Most nights last summer as I was on my way up onto the moors to film the Owls this Green Woodpecker was sunbathing on the top of a standing stone. It is only a record shot, as there was no way of getting any closer, but it shows that we were not the only inhabitants of the Pennines to enjoy that fabulous weather.